ATHENS, Ala. – Busy sidewalks, city sidewalks, dressed in holiday style…In the air there’s a feeling of Christmas! That’s right! Once again all the joys of the ChristmasSeason are headed back to downtown Athens for Christmas Open House, November 16, 17 and 18! 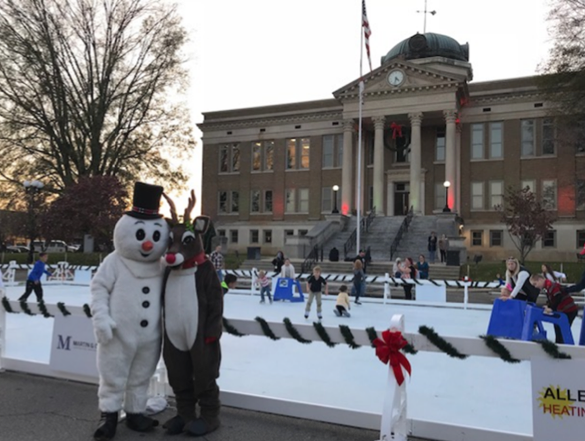 This year marks the 32nd year of the Athens Christmas Open House, organized by the Greater Limestone County Chamber of Commerce and Athens Main Street. Each year, Christmas Open House kicks off the holiday shopping season. And this year, Athens is celebrating their Bicentennial so the community is invited to come “Shop, Skate, and Celebrate 200 Years”. The theme for Christmas Open House will be “A Bicentennial Christmas”. In addition to our traditional Christmas OpenHouse activities, there will be a number of Bicentennial celebrations also taking place during the weekend. Supporting our local merchants is a big reason for hosting Christmas Open House and we encourage the community to come out and shop local to kick off their holiday shopping. Many businesses will have in-store specials and discounts, provide kid-friendly holiday crafts, and have holiday refreshments to enjoy. You can also register for the Grand Prize, compliments of Hobbs Jewelers, at each participating Christmas Open House business. The Grand Prize drawing will take place on Sunday at 4:00 p.m. and you do not have to be present to win. Below is a list of activities happening November 16th – November 18th during Christmas Open House Weekend. Skating on the Square presented by Premier Structures, Redstone Federal Credit Union and Rogers Group: FRIDAY: 4 pm – 8 pm, SATURDAY: 11 am – 8 pm and SUNDAY: 1 pm – 4 pm The cost is $5.00 per person to skate and includes your ice skate rental. Blizzard Bash on the Square sponsored by ServPro – Join us downtown for some snowfall fun at the Blizzard Bash every hour during skating hours. Visit and Photos with Santa & Mrs. Claus sponsored by Window World. Santa will arrive by Firetruck to downtown Athens on Saturday at Sunday at 1:00 p.m. Photos with Santa will be available at the Athens State University Center for Lifelong Learning on Saturday and Sunday from 1pm – 3pm. Photos are $10 and photography will be provided by Seventeenth & Pear. Kids can also write their Christmas letters to Santa and place them in his magical North Pole mailbox while they wait to meet him. Costume Characters and Carolers – Enjoy visiting with Bicentennial era characters and enjoy live entertainment from local musical artists as you stroll through downtown during the weekend. Lions Club Christmas Train Ride – Athens Lions Club will be bringing their train to downtown for rides around the skating rink on Marion Street. There is no charge to ride the train. “Elf on the Store Shelf” – For our merchants not located in downtown Athens, be sure and look around for the “Elf on the Store Shelf” while you shop! If you find him, bring him by the Chamber of Commerce offices on November 19th or 20th to receive a special surprise. Trade Days Photo Recreation – Saturday at 2pm, A photographer will take a photo of the crowd on Marion Street to recreate the historic Trade Day photo from the early 1900s. Athens Main Street Trivia Contest for Car Giveaway – Dealers Auto Auction donated a Kio Rio to Athens Main Street. You can donate $5/ticket or $10/3 tickets to Athens Main Street to enter to participate in the Bicentennial Trivia Contest. The trivia contest will take place on Saturday at 2pm at the Courthouse Steps (Marion Street). Five tickets will be drawn to participate in the trivia contest. The winner of the trivia contest wins the car. Donation tickets can be purchased at Athens State University Center for Lifelong Learning Friday evening and the Saturday morning of Christmas Open House. As you can see, it will be a packed weekend with lots of shopping, skating and celebrating! We hope you make plans to enjoy this family friendly event for a weekend of shopping and yuletide fellowship as we celebrate 200 years in our community.